This article is about the cells of the immune system also known as white blood cells. For the album by the band the White Stripes, see White Blood Cells (album). White blood cells (also called leukocytes or leucocytes and abbreviated as WBCs) are the cells of the immune system that are involved in protecting the body against both infectious disease and foreign invaders. All white blood cells are produced and derived from multipotent cells in the bone marrow known as hematopoietic stem cells. Leukocytes are found throughout the body, including the blood and lymphatic system. All white blood cells have nuclei, which distinguishes them from the other blood cells, the anucleated red blood cells (RBCs) and platelets. Types of white blood cells can be classified in standard ways. Two pairs of broadest categories classify them either by structure (granulocytes or agranulocytes) or by cell lineage (myeloid cells or lymphoid cells). These broadest categories can be further divided into the five main types: neutrophils, eosinophils (acidophiles), basophils, lymphocytes, and monocytes. These types are distinguished by their physical and functional characteristics. Monocytes and neutrophils are phagocytic. Further subtypes can be classified; for example, among lymphocytes, there are B cells, T cells, and NK cells. The number of leukocytes in the blood is often an indicator of disease, and thus the white blood cell count is an important subset of the complete blood count. The normal white cell count is usually between 4 × 109/L and 1.1 × 1010/L. In the US, this is usually expressed as 4,000 to 11,000 white blood cells per microliter of blood. White blood cells make up approximately 1% of the total blood volume in a healthy adult, making them substantially less numerous than the red blood cells at 40% to 45%. However, this 1% of the blood makes a large difference to health, because immunity depends on it. An increase in the number of leukocytes over the upper limits is called leukocytosis. It is normal when it is part of healthy immune responses, which happen frequently. It is occasionally abnormal, when it is neoplastic or autoimmune in origin. A decrease below the lower limit is called leukopenia. This indicates a weakened immune system. 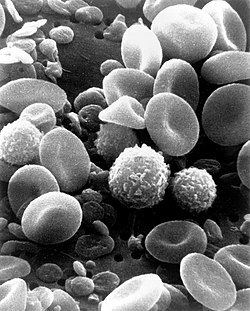 The name "white blood cell" derives from the physical appearance of a blood sample after centrifugation. White cells are found in the buffy coat, a thin, typically white layer of nucleated cells between the sedimented red blood cells and the blood plasma. The scientific term leukocyte directly reflects its description. It is derived from the Greek roots leuk- meaning "white" and cyt- meaning "cell". The buffy coat may sometimes be green if there are large amounts of neutrophils in the sample, due to the heme-containing enzyme myeloperoxidase that they produce. All white blood cells are nucleated, which distinguishes them from the anucleated red blood cells and platelets. Types of leukocytes can be classified in standard ways. Two pairs of broadest categories classify them either by structure (granulocytes or agranulocytes) or by cell lineage (myeloid cells or lymphoid cells). These broadest categories can be further divided into the five main types: neutrophils, eosinophils, basophils, lymphocytes, and monocytes. These types are distinguished by their physical and functional characteristics. Monocytes and neutrophils are phagocytic. Further subtypes can be classified. Granulocytes are distinguished from agranulocytes by their nucleus shape (lobed versus round, that is, polymorphonuclear versus mononuclear) and by their cytoplasm granules (present or absent, or more precisely, visible on light microscopy or not thus visible). The other dichotomy is by lineage: Myeloid cells (neutrophils, monocytes, eosinophils and basophils) are distinguished from lymphoid cells (lymphocytes) by hematopoietic lineage (cellular differentiation lineage). Lymphocytes can be further classified as T cells, B cells, and natural killer cells. Natural killer cells: virus-infected and tumor cells. Neutrophils are the most abundant white blood cell, constituting 60-70% of the circulating leukocytes, and including two functionally unequal subpopulations: neutrophil-killers and neutrophil-cagers. They defend against bacterial or fungal infection. They are usually first responders to microbial infection; their activity and death in large numbers form pus. They are commonly referred to as polymorphonuclear (PMN) leukocytes, although, in the technical sense, PMN refers to all granulocytes. They have a multi-lobed nucleus, which consists of three to five lobes connected by slender strands. This gives the neutrophils the appearance of having multiple nuclei, hence the name polymorphonuclear leukocyte. The cytoplasm may look transparent because of fine granules that are pale lilac when stained. Neutrophils are active in phagocytosing bacteria and are present in large amount in the pus of wounds. These cells are not able to renew their lysosomes (used in digesting microbes) and die after having phagocytosed a few pathogens. Neutrophils are the most common cell type seen in the early stages of acute inflammation. The life span of a circulating human neutrophil is about 5.4 days. Eosinophils compose about 2-4% of the WBC total. This count fluctuates throughout the day, seasonally, and during menstruation. It rises in response to allergies, parasitic infections, collagen diseases, and disease of the spleen and central nervous system. They are rare in the blood, but numerous in the mucous membranes of the respiratory, digestive, and lower urinary tracts. They primarily deal with parasitic infections. Eosinophils are also the predominant inflammatory cells in allergic reactions. The most important causes of eosinophilia include allergies such as asthma, hay fever, and hives; and also parasitic infections. They secrete chemicals that destroy these large parasites, such as hook worms and tapeworms, that are too big for any one WBC to phagocytize. In general, their nucleus is bi-lobed. The lobes are connected by a thin strand. The cytoplasm is full of granules that assume a characteristic pink-orange color with eosin staining. Basophils are chiefly responsible for allergic and antigen response by releasing the chemical histamine causing the dilation of blood vessels. Because they are the rarest of the white blood cells (less than 0.5% of the total count) and share physicochemical properties with other blood cells, they are difficult to study. They can be recognized by several coarse, dark violet granules, giving them a blue hue. The nucleus is bi- or tri-lobed, but it is hard to see because of the number of coarse granules that hide it. They excrete two chemicals that aid in the body's defenses: histamine and heparin. Histamine is responsible for widening blood vessels and increasing the flow of blood to injured tissue. It also makes blood vessels more permeable so neutrophils and clotting proteins can get into connective tissue more easily. Heparin is an anticoagulant that inhibits blood clotting and promotes the movement of white blood cells into an area. Basophils can also release chemical signals that attract eosinophils and neutrophils to an infection site. B cells make antibodies that can bind to pathogens, block pathogen invasion, activate the complement system, and enhance pathogen destruction. CD4+ helper T cells: T cells displaying co-receptor CD4 are known as CD4+ T cells. These cells have T-cell receptors and CD4 molecules that, in combination, bind antigenic peptides presented on major histocompatibility complex (MHC) class II molecules on antigen-presenting cells. Helper T cells make cytokines and perform other functions that help coordinate the immune response. In HIV infection, these T cells are the main index to identify the individual's immune system integrity. CD8+ cytotoxic T cells: T cells displaying co-receptor CD8 are known as CD8+ T cells. These cells bind antigens presented on MHC I complex of virus-infected or tumour cells and kill them. Nearly all nucleated cells display MHC I.
γδ T cells possess an alternative T cell receptor (different from the αβ TCR found on conventional CD4+ and CD8+ T cells). Found in tissue more commonly than in blood, γδ T cells share characteristics of helper T cells, cytotoxic T cells, and natural killer cells. Natural killer cells are able to kill cells of the body that do not display MHC class I molecules, or display stress markers such as MHC class I polypeptide-related sequence A (MIC-A). Decreased expression of MHC class I and up-regulation of MIC-A can happen when cells are infected by a virus or become cancerous. Monocytes, the largest type of WBCs, share the "vacuum cleaner" (phagocytosis) function of neutrophils, but are much longer lived as they have an extra role: they present pieces of pathogens to T cells so that the pathogens may be recognized again and killed. This causes an antibody response to be mounted. Monocytes eventually leave the bloodstream and become tissue macrophages, which remove dead cell debris as well as attack microorganisms. Neither dead cell debris nor attacking microorganisms can be dealt with effectively by the neutrophils. Unlike neutrophils, monocytes are able to replace their lysosomal contents and are thought to have a much longer active life. They have the kidney shaped nucleus and are typically agranulated. They also possess abundant cytoplasm. Some leucocytes migrate into the tissues of the body to take up a permanent residence at that location rather than remaining in the blood. Often these cells have specific names depending upon which tissue they settle in, such as fixed macrophages in the liver, which become known as Kupffer cells. These cells still serve a role in the immune system. The two commonly used categories of white blood cell disorders divide them quantitatively into those causing excessive numbers (proliferative disorders) and those causing insufficient numbers (leukopenias). Leukocytosis is usually healthy (e.g., fighting an infection), but it also may be dysfunctionally proliferative. WBC proliferative disorders can be classed as myeloproliferative and lymphoproliferative. Some are autoimmune, but many are neoplastic. Another way to categorize disorders of white blood cells is qualitatively. There are various disorders in which the number of white blood cells is normal but the cells do not function normally. Neoplasia of WBCs can be benign but is often malignant. Of the various tumors of the blood and lymph, cancers of WBCs can be broadly classified as leukemias and lymphomas, although those categories overlap and are often grouped as a pair. A range of disorders can cause decreases in white blood cells. This type of white blood cell decreased is usually the neutrophil. In this case the decrease may be called neutropenia or granulocytopenia. Less commonly, a decrease in lymphocytes (called lymphocytopenia or lymphopenia) may be seen. Neutropenia can be acquired or intrinsic. A decrease in levels of neutrophils on lab tests is due to either decreased production of neutrophils or increased removal from the blood. The following list of causes is not complete. Symptoms of neutropenia are associated with the underlying cause of the decrease in neutrophils. For example, the most common cause of acquired neutropenia is drug-induced, so an individual may have symptoms of medication overdose or toxicity. Treatment is also aimed at the underlying cause of the neutropenia. One severe consequence of neutropenia is that it can increase the risk of infection. Defined as total lymphocyte count below 1.0x109/L, the cells most commonly affected are CD4+ T cells. Like neutropenia, lymphocytopenia may be acquired or intrinsic and there are many causes. This is not a complete list. Like neutropenia, symptoms and treatment of lymphocytopenia are directed at the underlying cause of the change in cell counts. An increase in the number of white blood cells in circulation is called leukocytosis. This increase is most commonly caused by inflammation. There are four major causes: increase of production in bone marrow, increased release from storage in bone marrow, decreased attachment to veins and arteries, decreased uptake by tissues. Leukocytosis may affect one or more cell lines and can be neutrophilic, eosinophilic, basophilic, monocytosis, or lymphocytosis. Neutrophilia is an increase in the absolute neutrophil count in the peripheral circulation. Normal blood values vary by age. Neutrophilia can be caused by a direct problem with blood cells (primary disease). It can also occur as a consequence of an underlying disease (secondary). Most cases of neutrophilia are secondary to inflammation. A normal eosinophil count is considered to be less than 0.65×109/L. Eosinophil counts are higher in newborns and vary with age, time (lower in the morning and higher at night), exercise, environment, and exposure to allergens. Eosinophilia is never a normal lab finding. Efforts should always be made to discover the underlying cause, though the cause may not always be found. The complete blood cell count is a blood panel that includes the overall WBC count and various subsets such as the absolute neutrophil count. Reference ranges for blood tests specify the typical counts in healthy people. TLC- (Total leucocyte count): Normal TLC in an adult person is 6000-8000WBC/mm^3 of blood. DLC- (Differential leucocyte count): Number/ (%) of different type of leucocyte in per cubic mm. of blood. ^ Maton D, Hopkins J, McLaughlin CW, Johnson S, Warner MQ, LaHart D, Wright JD, Kulkarni DV (1997). Human Biology and Health. Englewood Cliffs, New Jersey, US: Prentice Hall. ISBN 0-13-981176-1. ^ a b LaFleur-Brooks M (2008). Exploring Medical Language: A Student-Directed Approach (7th ed.). St. Louis, Missouri, US: Mosby Elsevier. p. 398. ISBN 978-0-323-04950-4. ^ "Vital and Health Statistics Series 11, No. 247 (03/2005)" (PDF). Retrieved 2 February 2014. ^ a b c d e Alberts B, Johnson A, Lewis M, Raff M, Roberts K, Walter P (2002). "Leukocyte also known as macrophagesfunctions and percentage breakdown". Molecular Biology of the Cell (4th ed.). New York: Garland Science. ISBN 0-8153-4072-9. ^ "Medical gallery of Blausen Medical 2014". WikiJournal of Medicine. 1 (2). doi:10.15347/wjm/2014.010. ^ Orkin SH, Zon LI (February 2008). "SnapShot: hematopoiesis". Cell. 132 (4): 712. doi:10.1016/j.cell.2008.02.013. PMID 18295585. ^ a b Daniels VG, Wheater PR, Burkitt HG (1979). Functional histology: A text and colour atlas. Edinburgh: Churchill Livingstone. ISBN 0-443-01657-7. ^ Handin RI, Lux SE, Stossel TP (2003). Blood: Principles and Practice of Hematology (2nd ed.). Philadelphia: Lippincott Williams and Wilkins. p. 471. ISBN 9780781719933. Retrieved 18 June 2013. ^ a b c d Saladin K (2012). Anatomy and Physiology: the Unit of Form and Function (6 ed.). New York: McGraw Hill. ISBN 978-0-07-337825-1. ^ Wheater PR, Stevens A (2002). Wheater's basic histopathology: a colour atlas and text (PDF). Edinburgh: Churchill Livingstone. ISBN 0-443-07001-6. ^ Pillay J, den Braber I, Vrisekoop N, Kwast LM, de Boer RJ, Borghans JA, Tesselaar K, Koenderman L (July 2010). "In vivo labeling with 2H2O reveals a human neutrophil lifespan of 5.4 days". Blood. 116 (4): 625–7. doi:10.1182/blood-2010-01-259028. PMID 20410504. ^ Falcone FH, Haas H, Gibbs BF (December 2000). "The human basophil: a new appreciation of its role in immune responses". Blood. 96 (13): 4028–38. PMID 11110670. ^ a b c d e f Kumar V, et al. (2010). Robbins and Cotran pathologic basis of disease (8th ed.). Philadelphia, PA: Saunders/Elsevier. ISBN 1416031219. ^ a b c d e f g Kaushansky K, et al., eds. (2010). Williams hematology (8th ed.). New York: McGraw-Hill Medical. ISBN 978-0-07-162151-9. ^ McPherson RA, Pincus MR, Abraham NZ, et al. (eds.). Henry's clinical diagnosis and management by laboratory methods (22nd ed.). Philadelphia, PA: Elsevier/Saunders. ISBN 1437709745. ^ a b c d Goldman L, Schafer AI (eds.). Goldman's Cecil medicine (24th ed.). Philadelphia: Elsevier/Saunders. ISBN 1437716040. ^ McBride JA, Dacie JV, Shapley R (February 1968). "The effect of splenectomy on the leucocyte count". British Journal of Haematology. 14 (2): 225–31. doi:10.1111/j.1365-2141.1968.tb01489.x. PMID 5635603. 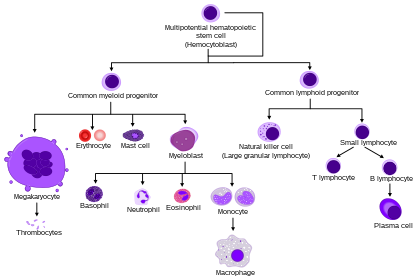 Wikimedia Commons has media related to Leukocytes. This page was last edited on 17 October 2018, at 07:01 (UTC).